"It was so sad to see." The civet cat did not like being in a cage. He hissed and clawed at the mesh, searching for a way out. 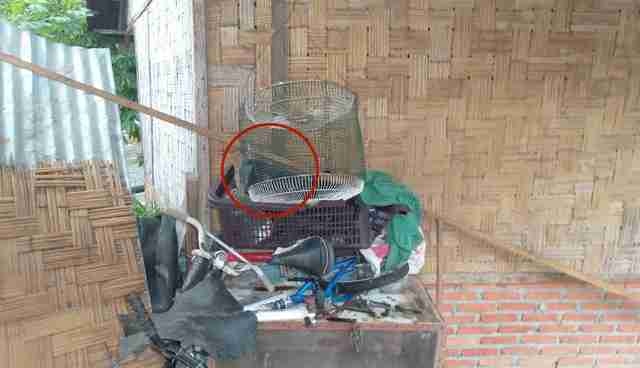 Swiss tourists Erika and Freddy Kappeler were visiting Bukit Lawang, Indonesia, when they noticed the civet on the front porch of a villager's house. The tiny mesh cage sat on top of a junk heap, along with bike parts, a broken basket and old clothing. Sun shone directly onto the cage. Civets - who aren't actually cats, but are a type of viverrid - are also nocturnal, and they spend their days sleeping, so the direct sunlight would have been quite stressful for the animal. "My husband saw the civet cat," Erika Kappeler told The Dodo. "It was so sad to see." The couple snapped a photo and sent it to Bobi Handoko, an Indonesian man who runs a local animal rescue group called Ecoproject. When Handoko saw the photo, he dropped everything and went to see for himself. "There was a woman in the house," Handoko told The Dodo. "I told her that Erika and Freddy informed me about the civet captured behind her house, I asked her what's the purpose of keeping the civet and why? Then she said, 'It's my son who took him.'" The woman didn't say why her son had taken the civet cat, but he probably planned to sell the civet in the city markets. 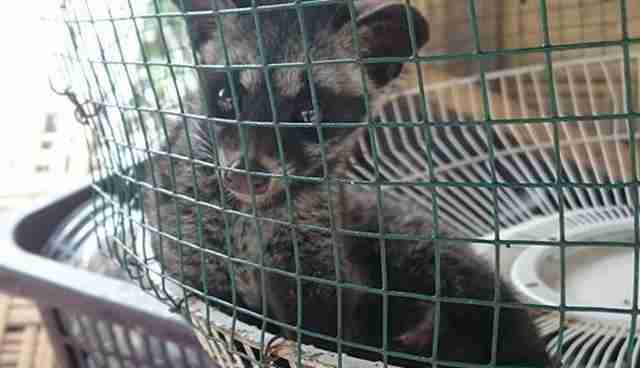 Indonesians will keep civets as pets, or eat their meat. 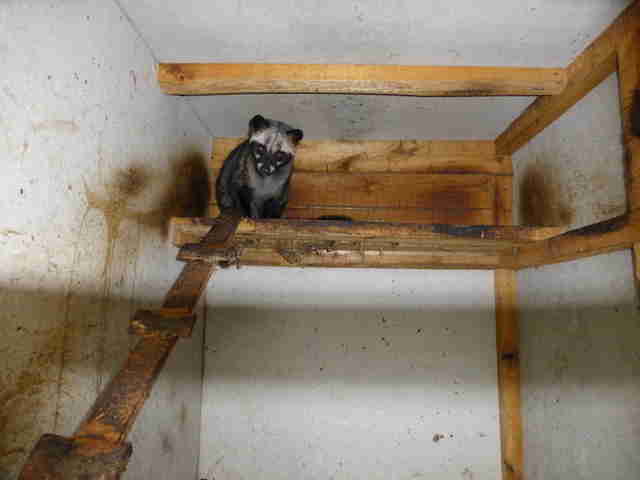 Civets are also used in the coffee industry in a bizarre way - they're kept in cages and force-fed coffee berries. When civets expel the partially digested berries, their waste is turned into a specialty coffee called kopi luwak. 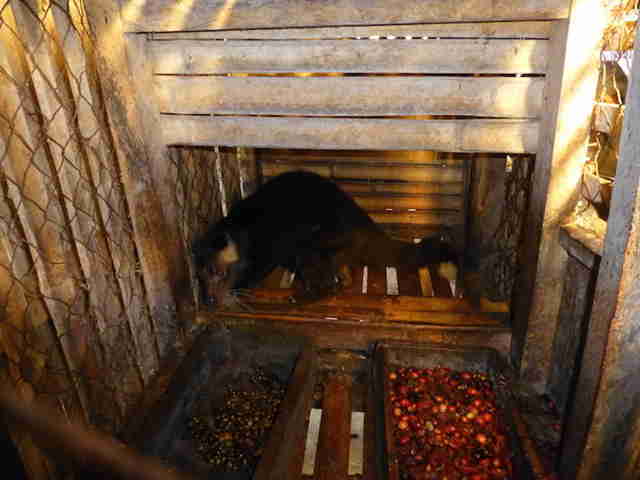 Many kopi luwak producers claim that this coffee-making process doesn't harm civet cats, but that couldn't be further from the truth - when force-fed coffee berries, civets easily become malnourished and sick. Captive civets have even been documented chewing off their own legs, which could be due to the stress of captivity, or the near-lethal doses of caffeine they need to consume. 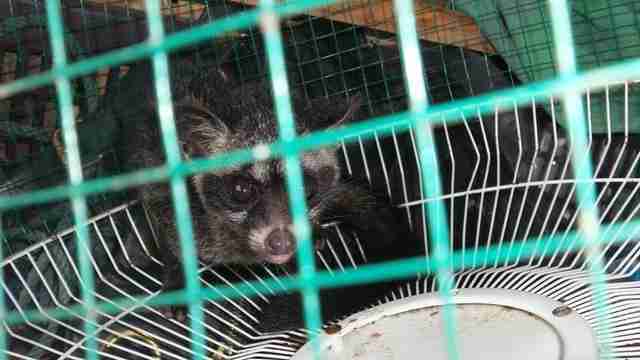 According to the woman, this civet cat had been in the cage for two days. "After I explained to her what is the mission of Ecoproject, then she agreed to hand over the civet for free," Handoko said. 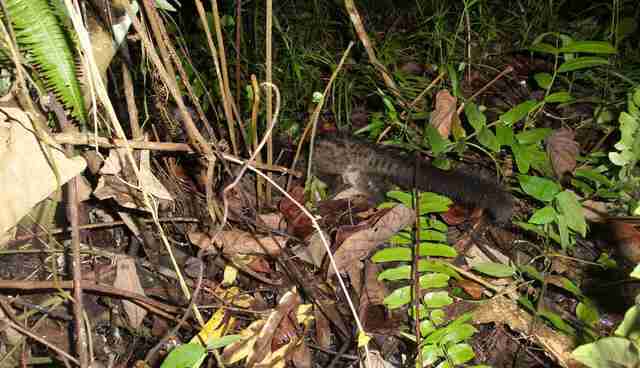 "I also talked to her son to explain that the civet will be better wild and free." 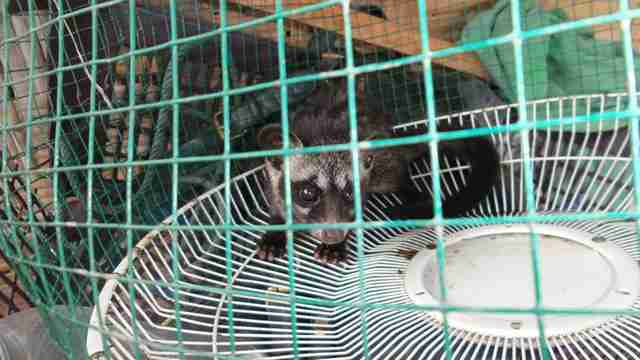 Since the civet seemed to be in good physical shape, Handoko decided to release him right away. 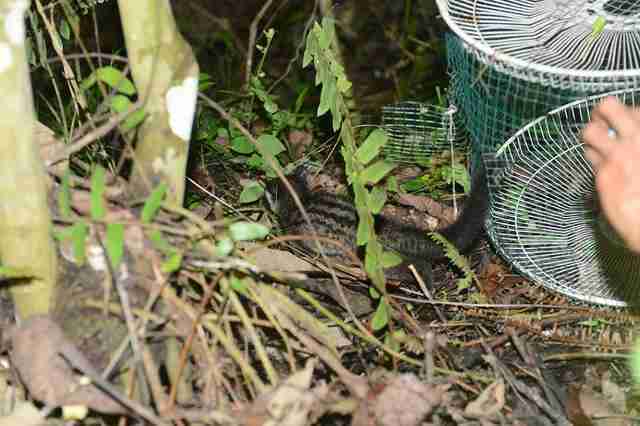 When night fell, Handoko and the Ecoproject team took the civet into the jungle. "He disappeared in a few seconds in the bushes without saying 'thank you' to me," Handoko said. "Even a friend of mine who is a wild bird photographer had not many chances to get the pictures." "I love to see the animals in the wild, and the civet jump from tree to another tree," Handoko said. "How beautiful it is. It's definitely a crazy idea to keep animals in captivity. People should think and imagine if they are in jail, it's same like animals." 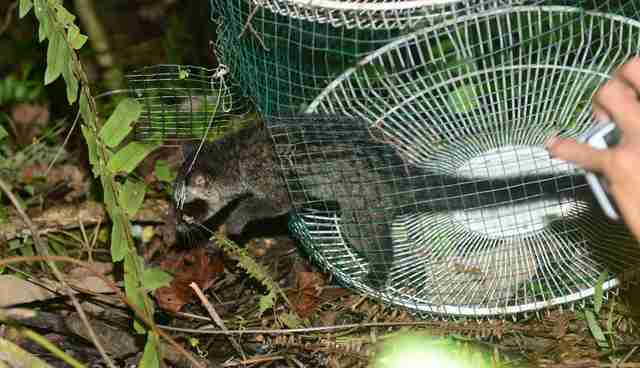 To help more civets - as well as birds, snakes and other wild animals in North Sumatra - you can make a donation here. You can also sign this pledge to never buy civet coffee or support the industry in any way.